The leader of the Indigenous People of Biafra have finally unveil the real identity of the PDP presidential candidate, Atiku Abubakar during his Weekly broadcast live on Radio Biafra saying; Atiku is From Cameroon. “Do you know that Atiku Abubakar is from Cameroon? His area of Adamawa was in Cameroon…,” Nnamdi Kanu, the leader of the indigenous people of Biafra (IPOB) said on Saturday. 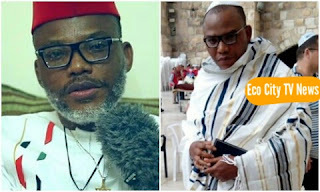 Speaking during a broadcast on Radio Biafra from London, Nnamdi Kanu reiterated the call for presidential election boycott, saying it is the only way to achieve Biafra. Nnamdi Kanu also alleged that the person behind the failure of Ekwueme in 1999 during the Peoples Democratic Party (PDP) convention was Atiku Abubakar. “The problem we have is that we don’t interrogate the source of the problem”. “Nigeria has effectively become a Fulani caliphate before our own very eyes”. “Those pressuring me to call off the election boycott know what to do, sign that document I gave to you and I will call off the election boycott..,” Kanu said.